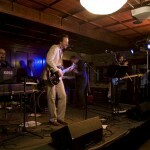 A Chicago wedding band that's not afraid to rock. Our ongoing mission: To summon the eternal spirits of Rock and set them loose on your event. We, Unity Candle vows to fill your dance floor with an ageless mass of humanity, offering a mix of tunes classic enough to groove your grandmother and fresh enough to bring a smile to the face of your jaded twentysomething hipster cousin. The candle will set your party aflame! Nearly two decades ago, in the unforgiving hills of the North, the seeds of the Candle sprouted forth from the barren ground. Slowly, a hearty band of Rock Warriors gathered, dedicating themselves to the noble mission of moving hips and blowing minds. As their powers grew, these five soldiers descended upon the urban jungle of Chicago and since the Year of the Black Horse (2002) they have released the unbridled spirit of Rock upon weddings, birthdays, and other events across the region. Musical ninjas all, the members of We, Unity Candle have come to an intimate understanding of the ageless mysteries of the Spirit of Rock. They have dedicated themselves to a singular mission: bringing together the young and the old, the rockabilly and the indie rocker, the Lords of the Mosh Pit and the Ladies of the Discotheque, as one on the dance floor. Through their music—a masterful blending of oldies, classic rock, and the edgiest rock of the last decade—the Candle emits a powerful tractor beam that draws people of all ages inexorably toward the dance floor to gawk, tremble, groove, scream, and shake what their mamas gave ’em. The Candle will take your party to 11. When performing their own original music, the members of We, Unity Candle have often been known as Sundayrunners and/or the Buddyrevelles. In those guises, they have recorded nearly ten albums of powerful and poppy indie rock, and their music has been featured on Pitchfork.com, as well as The O.C., MTV’s The Real World, VH1, and other network television programs. They have performed across the U.S., Canada, and Europe in tiny clubs and on huge festival stages, supporting such acts as Tobin Sprout & Guided By Voices, They Might Be Giants, and Soul Asylum just to name a few. Their original music draws inspiration from the vast breadth of the rock canon, from the classic songwriting of the British Invasion and 1970s AM pop to the rhythmic and formal innovations of Krautrock, electronica, and Chicago post-rock. They bring that personal investment in the best of Rock’s past to every performance, offering a clever modern twist on the music you love. This ain’t your daddy’s wedding band.